Originally constructed in 1962, the Higgins Avenue Bridge is deteriorating and is in need of rehabilitation to extend the life of the bridge. Various structural elements are in need of repair and the concrete deck requires replacement. Additionally, the Higgins Avenue Bridge is a vital transportation link across the Clark Fork River that has been identified by the City of Missoula as a priority for improving multimodal transportation. The objectives of this project are to repair or rehabilitate the deteriorated elements of the bridge in a cost-eﬀective manner and improve multimodal transportation facilities across the bridge to the extent practicable. The structural rehabilitation of the bridge will include: bridge deck replacement; repair the steel superstructure as needed; spot painting the steel superstructure; repair or replace bearings as needed; and minor repairs to the concrete substructure units. 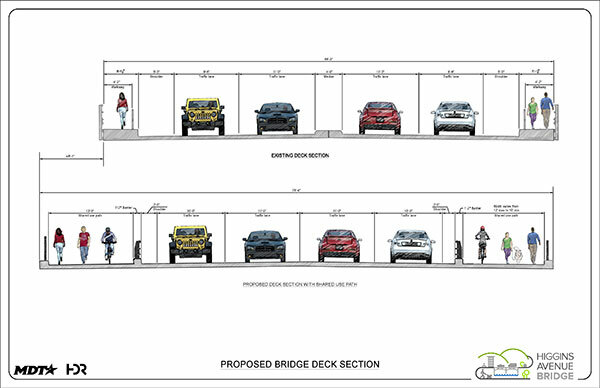 Multimodal transportation enhancements on the bridge will include widening the bridge to provide additional space for bicycles and pedestrians. 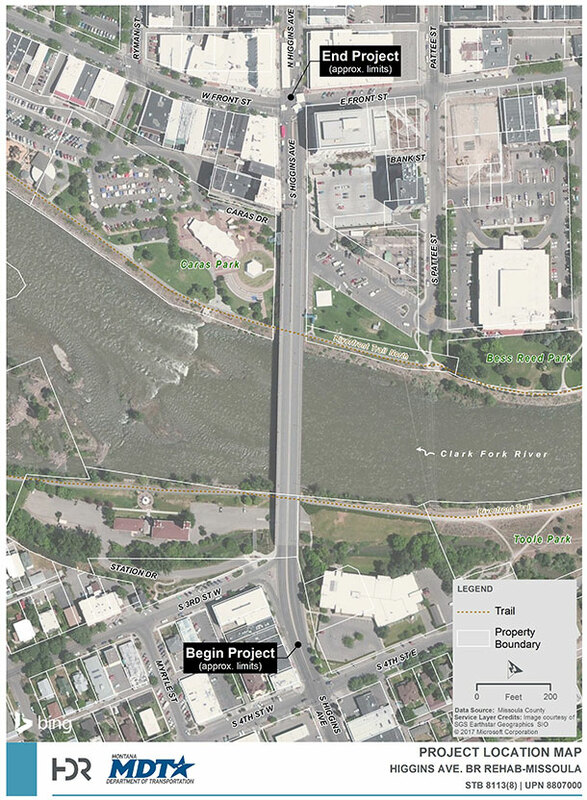 Past coordination between MDT, City of Missoula, and stakeholders had determined a typical cross section for the bridge, which included shared bicycle-pedestrian space on both sides of the bridge. Since then, an additional option to provide separated walkways with bike lanes adjacent to traffic was considered. Both of these options were presented at the public meeting on April 4, 2018. Based on coordination with MDT, the City, and the project stakeholder group, the shared space alternative has been advanced into final design. The typical sections for the existing bridge and the two design options considered are shown below. The east edge of bridge will be maintained at the current location and the widening will occur to the west. The existing bridge piers located on dry land will be widened to the west to accommodate an additional beam line to support the wider bridge deck. Over the river, the wider bridge deck will be supported using a cantilever system to avoid work in the river.